Not sure what to get Dad? Why not stock him up on some of the best tools out there! Channelock Tools are currently 15% off, and if you hurry now, you can have these great tools in time to wrap and put under the tree for the holiday. 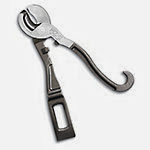 Channelock is the maker of the 89 Rescue Tool, the 87 Rescue Tool, and the 88 Rescue Tool--all tools that are loved and raved about by firefighters who use them daily on the scene. They are tools that chocked full of other tools, such as pry bars, spanner wrenches, cutters, and gas shut off devices, to name a few. It's that perfect multi-tool that is sure to put a smile on anyone's face who appreciates a good design and extreme functionality. 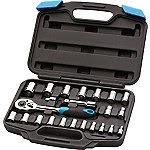 We sell a great tool-roll packed with a variety of pliers that makes an awesome gift, or even a 24 piece uni-fit socket set that would sure to make any tool lover smile from ear to ear. Don't miss out on the chance to get Channelocks best tools for 15% off!